Line-dancing demonstration at last year’s Genki Living Expo, which celebrated Keiro’s 50th anniversary. Keiro Senior HealthCare has been named one of 34 finalists across the nation in the Aetna Voices of Health competition. Voting is now open at www.aetnavoicesofhealth.com until 9 p.m. PST on Sunday, Oct. 14, at which point Aetna will donate $30,000 to the organization receiving the most online votes and $20,000 to the second-place finisher. Aetna Voices of Health is an initiative to support visionaries who are closing the gap around health-care disparities by changing behaviors through informing and empowering others. 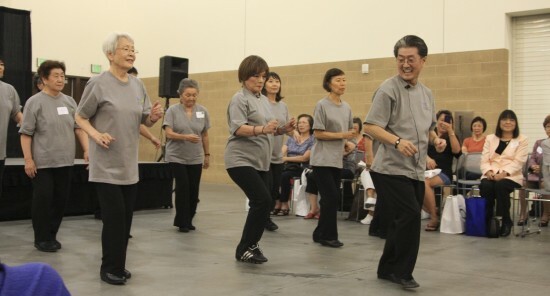 Keiro Senior HealthCare is the only nominated community health organization predominantly serving Asian Americans, and the only organization focused solely on older adults. Since 1961, over 125,000 families have trusted Keiro to provide peace of mind and the best care experience possible at Keiro Nursing Home, South Bay Keiro Nursing Home, Keiro Intermediate Care Facility, and Keiro Retirement Home. Through The Institute for Healthy Aging, Keiro empowers people to age with confidence and inspires lifestyles that support the quality of life you desire, in any life stage, no matter where you call home. If Keiro wins, the grant money would be used to enhance the quality of life for seniors and boost community programs to support healthy genki living. Everyone is encouraged to support Keiro by voting and telling their family and friends. Each email address may cast 10 votes. Keiro is a wonderful orgnaization doing spirited, uplifing work! Keiro is a blessing to our community!